After more than 40 years without a successful bond measure—including a crushing refusal of a proposed 2006 bond—Cuesta College’s administrators were starting to feel desperate. State funding was dropping, and the school was in dire need of funds. There was only one real option, they felt: Try for a bond again, but do it right this time. There was a palpable pall over the early internal bond discussions; no one wanted a repeat of 2006, and the school would be in some serious hot water if it didn’t get funding soon. PORTABLE PROBLEMS: Cuesta’s portable buildings are one of the major reasons administrators hope Measure L passes. 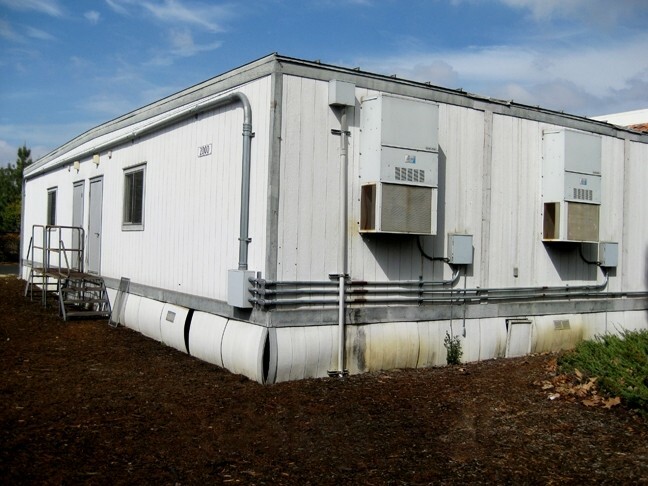 Due to a state education code, the portables all need to be retired in September 2015, which means more than 60,000 square feet of classrooms and offices need to be replaced in less than a year. Cuesta hired consulting firms to assess, reassess, and re-reassess the bond’s viability, molding the tiniest details of the measure into something that would both speak to voters and fulfill all of the items on the school’s checklist. In July, the college set it in stone: The bond will be for $275 million and will cost San Luis Obispo County property owners $19.45 per $100,000 of assessed value. It will pay for repairs, new buildings, technology upgrades, and retiring old debt. Now, Cuesta’s administration is holding its collective breath. Will the community decide to support the college this time around? Will voters be more receptive to this year’s $275 million than 2006’s $310 million? And what is Cuesta going to do if this one fails, too? Pat Mullen, president of Cuesta’s Board of Trustees, has thought long and hard about these questions and thousands more as he and the other trustees finalized the measure. Another bond failure would hamstring the school’s ability to function in the coming years, he explained. Repairs and refurbishments aren’t the school’s most imminent funding needs, though. Due to State Education Code 17292, Cuesta will have to discontinue use of its portable classrooms and office buildings by Sept. 30, 2015. Approximately 60,000 square feet of classes and offices will need a new home. Early on in the bond discussion process, Cuesta’s trustees and administrators jokingly suggested moving displaced classes to double-wide trailers in the parking lot or renting out retail space for classrooms. If the bond measure doesn’t pass, the real solution to this problem will be much more serious: cutting classes and firing teachers. “We’ll have to make significant additional cuts to be able to relocate the facilities and the student services that are housed in those buildings,” Mullen said. “We don’t have that kind of funding, so we’d have to find that by making cuts elsewhere. According to Mullen, state budget cuts are the main reason Cuesta needs to resort to a bond. In the past, the school was able to pay for its maintenance and new buildings with state funding, but college funding statewide will be more and more localized in coming years, Mullen said. Paul Feist, vice chancellor for communications for the California Community Colleges Chancellor’s Office, backed up Mullen’s claim. Feist added that California’s community colleges have seen and will continue to see decreased statewide funding. Feist also said that when a college gets a bond—even if it’s limited to only paying for facilities and repairs—the whole campus tends to flourish. That fiscal freedom could be either a good or a bad thing, depending on whom you ask. Financial planner and former congressional candidate Matt Kokkonen is not so quick to trust the trustees. Kokkonen is against Measure L and believes that Cuesta’s Board of Trustees has been putting too much money into salaries and not enough into infrastructure. He believes that giving the school more funding would only exacerbate the problem. Kokkonen claimed that the trustees are using their funding to raise their instructors’ salaries, and he’s worried that this bond money is also going to go into the teachers’ pockets. According to Deborah Stakes, head of the Cuesta College Federation of Teachers (CCFT), Kokkonen’s claims are off base, as Cuesta teachers haven’t had an across-the-board wage increase in more than six years. Regardless of how Cuesta got in this predicament, Kokkonen doesn’t think that adding another tax to what he believes is already a mountain of local taxes is the answer. He said that there are ways the school can fix its infrastructure without having to lean on the community. Though there are some SLO County citizens who, like Kokkonen, oppose Measure L, that group seems to be a minority compared to the “Yes on L: Keep Cuesta Strong” movement, which has more than 300 endorsements online. There’s actually no organized “No on L” citizen group, and no one stepped up to write an argument against the measure to put on the ballot. Intern Cliff Mathieson is searching high and low, trying to find people who oppose Measure L. He’s also a Cuesta student. Contact him via Executive Editor Ryan Miller at rmiller@newtimesslo.com.